Oh sure, everyone thinks they can reason with the Barbarians when they first show up. Then they burn your village to the ground. 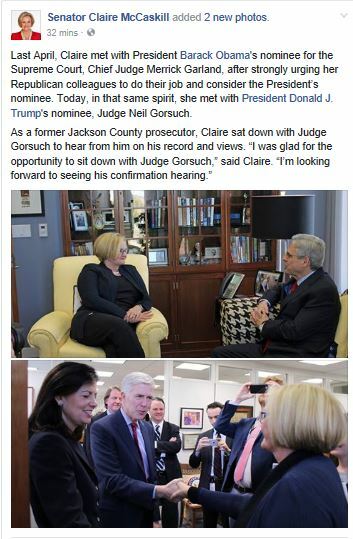 Last April, Claire met with President Barack Obama’s nominee for the Supreme Court, Chief Judge Merrick Garland, after strongly urging her Republican colleagues to do their job and consider the President’s nominee. 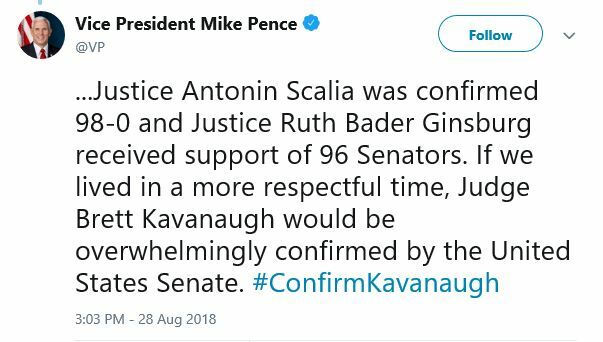 Today, in that same spirit, she met with President Donald J. Trump’s nominee, Judge Neil Gorsuch. In case you haven’t noticed yet, Claire, they’ve already lit their torches. Will Humpty Dumpty Blunt have a great fall? Oh, please let it be so. 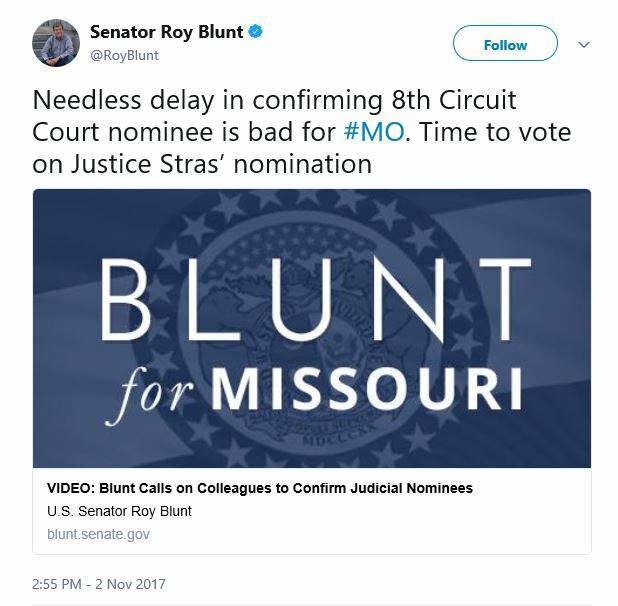 I know that we’re all at the mercy of bought-and-sold politicians everyday, but GOP Senator Roy Blunt has so little respect for the people who vote for him, that he doesn’t even try to hide the sold sign. What it would it be like to have a Senator who worked for us and not for Montsanto-AT&T-Exon-etc.? At least ostensibly. For that matter, if we (the people) manage to get Hillary Clinton (the assured candidate, I am assured by all) into the White House, she’ll need a few more Democrats in Congress and those in the know say that the Senate is the place where it can happen – only five Senate seats need to be flipped. (I know – Clinton could use lots more Democrats in the House as well, but that’s likely a fever dream.) 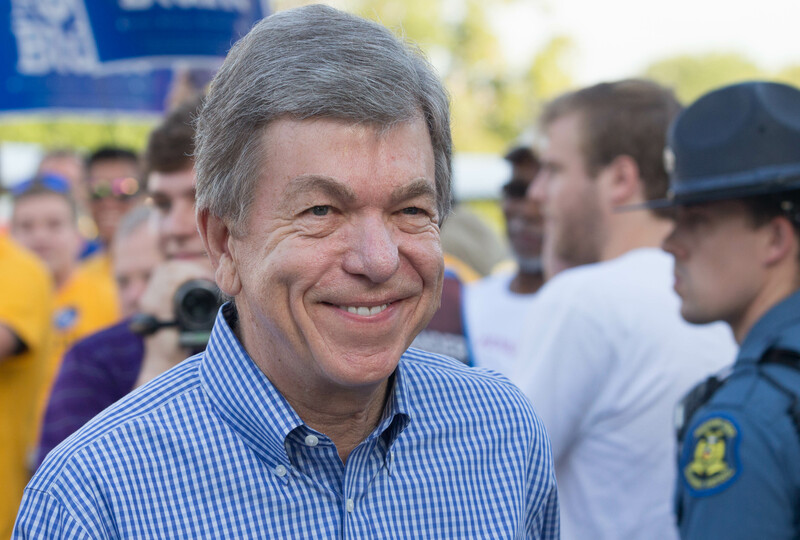 And best of all would be if one of the Democratic Senate upgrades could be Jason Kander, Roy Blunt’s challenger. I’ll be more than happy to see ol’ Roy to slink off to lobbyist paradise to reap the rewards for his untiring efforts on behalf of his heretofore unofficial clients. 8. Missouri (R-Blunt): This contest in the Show Me State might be the dark-horse contest to watch. Democrats got one of their best recruits this cycle when Secretary of State Jason Kander jumped in the race. Even Republicans privately admit that the 34-year-old Afghanistan veteran worries them running against Sen. Roy Blunt, whom Democrats are eager to paint as too much of a Washington insider. If Missouri comes in play in the presidential race, this one could quickly give Republicans a huge headache. There’ll be lots of corporate money in the mix this year, and we know that Blunt’s client base will probably put up to keep Blunt up, but now that he’s been identified as a weak link, the pressure to topple him will also escalate. And what a lovely sight Humpty Dumpty’s fall would be.